For this special day cooking in Marseille, I propose an original way to discover the city through some of its most emblematic recipes & ingredients : Bourride, Aïoli, Lamb anchovies butter, Pistou soup, Poutargue, Tapenade, Grilled red peppers, Eggplant caviar, Bouillabaisse.. 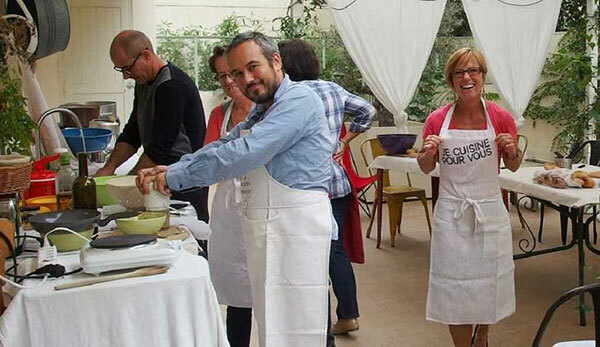 Cooking class Marseille, no doubt you will enjoy it ! There we will cook and enjoy several of the true & home-made Marseille specialties. It is near by the small fisherman’s port named Carry le Rouet, that our Marseille family based its countryside house early 20th century. My mother’s uncles were experienced fishermen in action till years 2000. They would bring back their catch has a trophee and after cooking, we would gather around a huge table to enjoy a Sea Bass with Tomatoed macaronis, a Bourride sauced with Aïoli or a majestic Bouillabaisse. It is this special family and reunion spirit that will drive us for our journey. I will have you discover the secrets of these well kept recipe in our home family cooking atelier on our spacious patio on St Jacques street. I will show you how to choose the right ingredients, and we will fix together the menu of the day. We will enjoy our work of art along with an Aix Rosé or a Cassis White wine and a few inside stories about the city and its inhabitants. We will meet at 9:30AM in front of Marseille’s Tourist office (11 La Canebière 13001 – Tel:0826 50 05 00). We will have a walk in the heart of the city starting by attending the Old Port fish market. We will meet the actual fishermen and select the right ingredients. Then we will attend the Capucins market to get our vegetables, aromatics and meats. Walking up Paradis street, we will first stop by my favorite wine shop to match our beverage with our dish, and after 10 minutes we will arrive in our home cosy apartment. The cooking atelier will take place in our fully equiped plant-covered patio. I will teach all the cooking basics needed and we will fix together or authentic provence recipes. We will set our table in the traditional way and we will share a lovely lunch (dessert and coffee included), while sharing a few stories about Marseille and its inhabitants. In the course of the afternoon (3 to 4PM), I will walk you back to the Canebière near the Old Port. For the full day, our walking time will approximately be 60 minutes. The price per person for a day is 160 euros for every services described. The day will take place with groups of at least 2 persons and with a maximum of 8 persons. For bigger groups get in touch with me. Different parties may gather, that’s even more fun. You can decide to be joined by a friend or relative only for lunch. The price will be of 80 euros. Things to do in Marseille ? While visiting the city, cooking in Marseille will be one of your highlights. 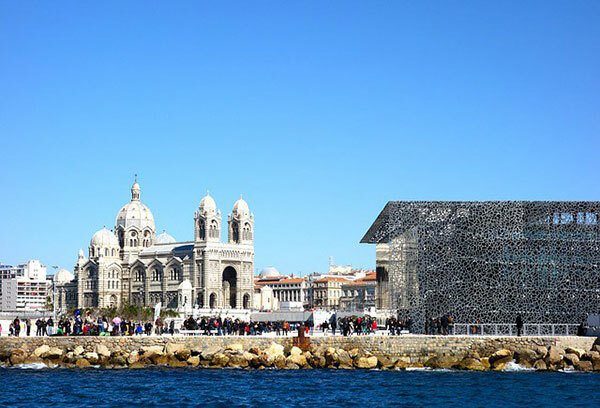 To decide what to do in Marseille, here are a few historical & cultural facts. Marseille is the oldest settled city in France. Its architecture and its inhabitants are a result of 2600 years of history. A welcoming imigration city of the Mediterranean, over time Marseille has build a strong identity benefiting from plural cultures. Along its glorious, properous or crises days, the city and its inhabitants have been prooving their resistance and reactivity. Sometimes caricatured, Marseille has always created a special interest and stimulated the french imaginary. The city is proud of its difference and identity, result of an exceptional history. From downtown to its amazing marina, its seaside from the Catalans to the Pointe Rouge, its history from the old town Panier to the renovated dock area of the Joliette, its hype spots of the Cours Julien to the Longchamps fountain Palace, you will discover a fascinating city and welcoming inhabitants. It is a journey in the heart of the city’s spirit that I propose to take you into with Provence Gourmet while cooking in Marseille. A day with a true Marseillais experiencing the local markets, recipes, food and wine.